Students participating in a University-related international travel activity (i.e., course work, internships, exchange programs, field work or research, for credit or not) are required to register their travel (in Canada or outside Canada) on Minerva. In order to register your travel on Minerva, your international activity will first have to be approved by your academic unit or research supervisor. McGill encourages students to include an international educational experience as part of their studies. However, the University will not approve student travel to all countries or regions of countries, as the safety of students is of primary importance. University-related activity will not be approved in locations for which the Government of Canada has issued an "avoid non-essential travel" or "avoid all travel" advisory. University-related courses, conferences and other activities undertaken in these locations will not receive McGill credit or recognition. If a Travel Advisory is in place restricting travel at the time of deployment, internships in that country will be cancelled. All interns are required to register with the foreign office of their country of citizenship before leaving Canada. Canadian students can register online here. If you are participating in an internship abroad (University-related international activity) you are required to participate in a pre-departure orientation session before you leave. University-wide sessions are hosted every semester by the Office of International Education. 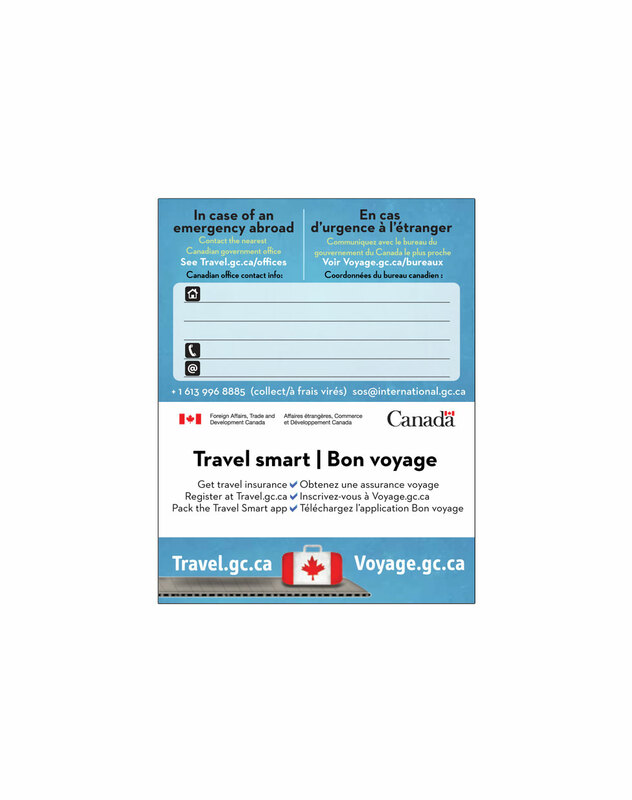 These sessions provide information about the travel registry, advice from McGill and Canadian government officials about consular services, regional safety, health, and travel tips, and specific information from regional experts on your host country. For more information, please click here. All interns are required to obtain their own health and travel insurance including proof of supplemental health insurance, emergency medical expense coverage and emergency evacuation insurance. For more information, please consult the section about travel insurance, on the international education's FAQs page here. Visa and entry requirements – all students: Interns are responsible for informing themselves about appropriate entry and work requirements for their host country. Students must acquire proper travel visas and work permits where applicable. Country-specific requirements can be found here. It is important that students begin this process early, as for many countries, it can take some time. Non-USA citizens interning in the USA: Non-USA citizens completing any internship (paid or unpaid) in the USA require a J-1 visa. Students should apply for a J-1 through Cultural Vistas or the SWAP Internship USA Program (Canadians and international students are eligible). Students should be prepared to pay $1,700 - $2,500 for a J-1, and should allow a six-week delay for processing. Neither ION nor the host organization are responsible for helping the student procure the visa, pay for a portion of the costs, or speed up the processing. International students with internships in Canada: International students require a Co-op/internship work permit if they are completing a mandatory internship (paid or unpaid) in Canada. For more information on mandatory internships, students should see McGill’s International Student Office, click here. For more information on non-mandatory internships, students should see McGill's International Student Office, click here. Canadian citizens interning outside of Canada: If you're a Canadian citizen aged 18-35, International Experience Canada (IEC) offers you the opportunity to work and travel abroad. IEC provides you a path to a work permit or visa to work in one of over 30 countries and territories. For more information, click here. The following are resources published by Foreign Affairs and International Trade Canada. They contain important and useful information for students travelling abroad for their internships. Students participating in a University-related travel activity (i.e., course work, internships, exchange programs, field work or research, for credit or not) should understand the requirements outlined in the McGill guidelines for Preparing for Safe Travel. Before traveling we recommend downloading the Global Affairs Travel Smart app for easy access to important and valuable information. The Travel Smart web app retains advisories for up to five countries directly to your phone and provides a checklist with links. It also has a very useful Assistance tab with contact information for the Canadian embassies, consulates and high commissions around the world including 24/7 emergency contacts. Remember to stay connected while traveling. It has been brought to our attention that for-profit “voluntourism” companies have been actively recruiting students. While students are free to take such tours at their own expense, this is not something that the Arts Internship Office can endorse by providing these firms a platform for selling their tours. For this reason, the McGill Internship Offices Network prepares students as much as possible to go with the proper mindset and help ensure that the organizations they work with are both appropriate and willing recipients of our tremendously motivated students. Aside from the fact that such tours fall outside of our efforts to ensure a good learning experience for students, the fact that they often generate significant profits by charging our students steep charges is antithetical to the university’s teaching mission and runs the risk of generating a backlash in host countries that will only make it more difficult for us to find quality internships for our students. Please note that the McGill Internship Offices Network does not fund for-profit, third-party, student-administered, or fee-based organizations which find internships for you. These programs are not eligible for academic, credit, or recognition on the Co-Curricular Record.